Andros Greece: the Greek Island of culture and nature! A vacation in Andros is a wonderful, unforgettable experience! The Greek Island of Andros has something for everyone, from ancient sites and historical monuments to lush nature paths and golden sandy beaches. Its excellent tourist infrastructure and its exquisite state-of-the-art museums make Andros Greece attractive to visitors from every corner of the world. The close proximity of Andros to Athens, has established it as one of the best holiday spots for short and long vacations. The island's connection with other islands in the Cyclades, also make it the perfect stop on an island-hopping adventure. Andros Greece is irresistible to nature aficionados. It is packed with charming walking paths beside streams and waterfalls that wind through villages. Some very rare flora and fauna can be seen on the walking paths, giving visitors the opportunity to "get in touch" with nature. Andros beaches are abundant and beautiful, especially the ones that are located in quaint bays and coves. The island of Andros Greece has been inhabited since the 10 th century BC, and historical evidence of its importance throughout the ages can be seen in many parts of the island. Ancient cities, century-old towers, impressive monasteries and precious relics displayed in museums for all visitors. Andros Greece possesses an extremely wide variety of hotels, dining and nightlife venues and other tourist facilities. It is a well-organized island that caters to thousands of tourists every year. There are Andros hotels for all budgets, entertainment venues for all musical tastes and dozens of shops and boutiques that carry everything a visitor of Andros will ever need. On the Greek Island of Andros, visitors will find an inexhaustible array of accommodations that satisfy all preferences and needs. You can be sure that you will be provided with the ideal Andros hotel accommodation that will cater to your personal style and taste. In the Andros Island vacation resorts of Batsi, Gavrio and Andros Town, there are both luxury and discount Andros hotels for all budgets. Andros Island is a vacation resort for all types of visitors. Some come for the beaches, some for nature walks and other for the cultural venues. Families and large groups of friends will find Andros hotels that offer spacious hotel rooms, studios and apartments. Couples are provided with romantic Andros hotel suites and rooms with a view of the Aegean Sea. Many hotels offer Andros Island vacation packages, which include accommodation, car rentals, excursions and other services. Enquire at your chosen Andros hotel about the extra services it provides. For more information about Andros hotel accommodation, including Andros hotels, apartments, studios, rooms for rent in Batsi, Kypri and other locations on Andros Island, Greece, click here . Imagine lying on soft sands, soaking up the warm rays of the sun, next to waves lapping upon the beach. If this seems like a dream, come to Andros. If you are vacationing on the eastern side of the island, you can visit the Andros beaches of Niborio, which can get quite crowded, or the quieter, pristine sandy Andros beaches of Vori and Achla, which you can reach by tour boat from Andros Town. The Andros beaches of Paraporti, Gialia, and Piso Gialia are lovely and perfect for those who just want to relax in the sun. The beach with the unusual name "to Pidima tis Grias" is one of the finest beaches on Andros Island, with a large, high rock spurting out of the sea. Along the southern coast of Andros Greece there are the popular beaches of Vintzi, Agia Ekaterini and Kantouni, while if you are in the mood for a bit of peace and quiet, we suggest Bouros, Kalamonari and Kremmydes. For those who are on holiday on the western side of the island , there is a wide range of splendid Andros beaches to choose from. A good map of Andros can show you the way to them, either by car or footpath. In Batsi, you can visit the long, organized beach of Chryssi Ammos, or if you prefer the superb Andros beaches of Agia Marina, Agios Kyprianos and pebbly Stivari. In nearby Gavrio, the port of the island, you will come across some fine Andros beaches, such as the long, sandy Agios Petros and Fellos. Paleopoli is located on a beautiful bay, with a stunning beach, which you can reach on foot. On the northern coast of Andros Island, you can swim at the beaches of Mikri Peza, Zorkos, Vitali and Ateni. We suggest renting a boat, acquiring an Andros map and exploring the coast of the island on your own. This way you have access to the remotest and most pristine Andros beaches. In Andros, visitors will find a wide range of entertainment and dining venues. The majority of the Andros nightlife is located in the popular tourist resorts of Batsi, Gavrio and Andros Town. All three have many restaurants and tavernas, as well as bars and clubs to choose from. For those looking for quieter Andros nightlife, Paleopoli is their best bet. Most Andros Islalnd villages offer quaint tavernas and ouzeries. We suggest having a meal in Apikia and Ormos Korthiou. To get a real "taste" of Andros, you should sample the local cuisine, which is scrumptious. Popular dishes include the island's specialty "froutalia" (omelet with sausage and potatoes), spicy cheese dip, sausages, fried zucchini blossoms, potato-balls, xerotyri (a locally-produced cheese), and a glass of famous Andros wine. Top your meal off with almond sweets, preseves, or kaltsounia (pastries with sweet cheese). 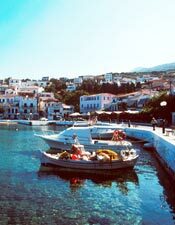 On Andros Island, Greece, visitors can experience the irresistible charm of the island's tradition. A number of festivals and fairs are held throughout the year. In Andros Town (Chora), August 15 is celebrated with a big fair that includes music, dancing and feasting, while during the summer months, Andros Town also hosts several cultural events. Gavrio is the location for the "Gavriotika" festival cultural performances, while in Batsi visitors can take part in the festival of the Monastery of Zoodochou Pigis on July 27. Ormos Korthiou is the location of two of the most important celebrations in Andros Greece: the "Korthiana" fair and the festival of Agios Fanourios on August 27. We recommend vacationing in Andros, Greece when the wonderful temporary art exhibitions at the Goulandris Museum of Modern Art and the "Ploes" musical events organized by the Petros and Marika Kydonieos Foundation are held. In Andros Greece, visitors have the opportunity to see a wide variety of sights and attractions. We recommend purchasing a good map of Andros that shows the historical and natural sites throughout the island. Starting off in the capital of the island, Andros Town (otherwise known as Chora), you should definitely visit the marvellous museums. The Archaeological Museum, which was founded by the Vasilis & Eliza Goulandris Foundation has some very fine exhibits, including most of the ancient artefacts found at the islands archaeological sites. The Maritime Museum in Andros Town displays a wide array of nautical objects, diaries, lithographs and models. The jewel of Andros Town is the Museum of Modern Art, which is also funded by the Goulandris Foundation. Visitors have the unique chance to see works of some of the finest painters and sculptors from Greece and abroad, including Fassianos, Tsarouchis, as well as frequent displays of works by Picasso, Matisse, Kandinsky, Chagall, and others. The Kairis Library possesses some 3000 rare manuscripts and books, historical archives and art work of the theologian Theofilos Kairis. Other sightseeing in Andros Town includes the Tourlitis Lighthouse, located on a large rock in the middle of the sea, and the Churches of Panagia Theoskepasti and Panagia Thalassini. For the archaeology enthusiasts, Andros offers several wonderful ancient sites. In Paleopoli, there are two of the finest sites on the island: the Ancient City of Andros and the Geometric Settlement of Zagora, where visitors can see the remains of various structures, including houses, walls, and gates. Paleopoli also has an archaeological museum which displays various aretfacts found at the sites. The Tower of Agios Petros in Gavrio, is one of the best-preserved ancient towers in Greece. Its indoor area contains a spiral staircase that connects 5 levels. Ancient Ispili is located on a hill near the town of Batsi, and includes a number of structures. Excavation of Ispili is ongoing. Elsewhere on Andros Island Greece, you can visit the many impressive churches and monasteries. Probably the most well-known is the Monastery of Zoodochou Pigis in Batsi, while it is also worthwhile visiting the Monastery of Panachrandou, which offers a stunning view of Andros Town and the 12 th century Monastery of Sotiros, near Vitali. The Epano Kastro, located in the Ormos Korthiou site has remains of a Medieval Town. Andros is a paradise for nature and outdoor sports lovers. The island is scattered with springs and streams, which attract a lot of tourists to Andros. There are several lovely foot paths that are the same as those that existed in ancient times. All you have to do is to secure a reliable map of Andros Greece and make your walking tour a reality. The paths lead through villages, across stone bridges and along lush hillsides. You can stop at the springs and sample the waters, which are believed to have healing properties for various conditions, including kidney and stomach problems. The most visited areas are Apikia, with the Sariza Spring and the Ravine of Pithara, and the village of Remata, with the scenic waterfalls and watermill. Andros , Greece has mild weather throughout the year, with a bit more rainfall than other Cyclades Islands, which is the reason for the island's beautiful vegetation. In, general the weather in Andros is sunny and bright, apart from some showers in the winter months. Winter weather in Andros is similar to the weather of other Cycladic Islands, with temperatures between 8°C and 13°C. Spring is one of the best times to visit Andros Greece. Temperatures rise, ranging from a pleasant 15°C to 22°C. As the summer comes round, the weather in Andros gets quite warm, but still remains enjoyable, with average temperatures between 24°C and 30°C. Autumn time in Andros, Greece continues to be a wonderful season for vacations, as temperatures range in the mid teens and the low 20s. The Meltemi wind, which blows in July and August, cool down the hottest months, especially on the northeastern side of Andros Island. Its close proximity to Athens makes Andros Island a fine location for both long and short holidays. There are frequent ferry boats to Andros from Rafina Port, which is located approximately 30 km from the center of Athens. Ferries to Andros Port in Gavrio are especially frequent during the summer, when the island is a major vacation resort. The ferry from Rafina to Andros Greece takes approximately 2 hours, while a hydrofoil from Rafina Port takes about 1 hour. If you want to ensure yourself a seat on a ferry to Andros Island, you should book in advance, particularly during the high tourist season. Apart from Rafina Port, ferries from Andros Port connect the island to other Cyclades Islands (Kea, Kythnos, Mykonos, Naxos, Paros, Syros and Tinos) and several islands in the Northeastern Aegean cluster, including Chios and Lesvos. If you are arriving in Greece by airplane at the Athens Airport "Eleftherios Venizelos", you can easily reach Rafina Port by bus or taxi, and from there board a ferry to Andros Island Greece.